Wooden Mallet's display racks offer versatility and style in a compact unit. Our unique overlapping design neatly displays and organizes your literature, keeping it tidy and visible in the least amount of space. 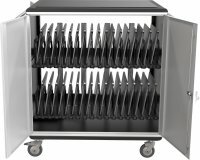 Our racks feature furniture quality construction with 3/4" solid oak sides sealed in a durable state-of-the-art finish. This rack features four total sides with each side containing 4 magazine pockets. This means 16 total magazine pockets in a very confined space. Because this rack spins and revolves a full 360 degrees, all pockets of literature are easy to view and access. This rack really finds its mark on a table, desk or countertop. It is compact yet sturdy. This rack is made out of durable oak wood construction and each of the 16 pockets are ¾" deep, providing ample room for reading material. 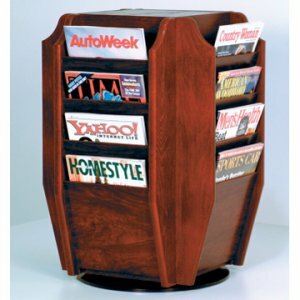 Place this rack in a waiting room for your patients or in a lobby for your clients. Made in the USA.